We just had too much to do, one day in the Willamette Valley wasn’t enough. So the next day we loaded up our rental car and went back to the wineries that we had missed. There was a problem with a second day; we didn’t have a place for lunch. Everyone we asked had told us that the Dundee Bistro was the only place worth trying. Luckily, I had the “yelp!” application on my phone, and Tina’s Café came highly recommended. We decided to give it a shot. It’s a nice, unpretentious restaurant, one that seems ingrained into the local community. I’m still not sure why people didn’t recommend it. 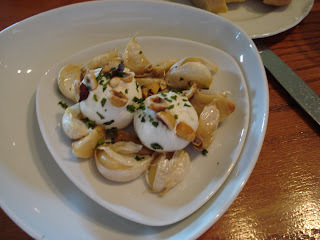 That’s warmed cypress grove chevre with roasted garlic, and it’s where I should have stopped. Not because the entrée was subpar, but because this was that damn good. Fortunately or unfortunately, I had got my father into cheese and he helped himself to this dish. I really should keep my culinary interests to myself. 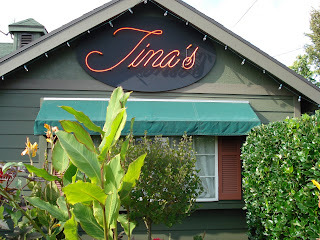 As much as Tina’s was a respite from the elements, there were some less than stellar dishes. The corn soup might have been fresh, but it wasn’t at all memorable. The penne pasta with vegetables and Italian sausage paled in comparison to version my father had ordered at the Dundee Bistro. This lamb stew had potential. 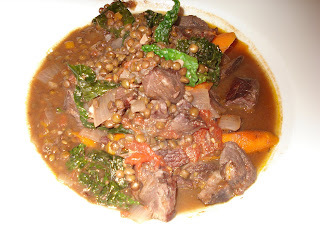 Accompanied by green lentils and braising greens, this dish needed more time to develop. However, there were two standouts from the meal. Good onion rings are hard to come by. More often than not the moisture from the onion causes the crust to separate from the rings. 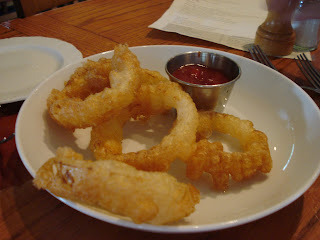 The onion rings at Tina’s Café suffered no such problems and were the best I’ve had in quite some time. You may not believe it but there are pieces of bread underneath all that tomatoey goodness. This was an excellent example of late season heirloom tomatoes. 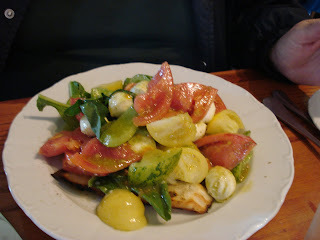 Combine that with the fresh mozzarella, and you have a combination that is hard to beat. If I had to recommend one restaurant in Dundee, it would be the Dundee Bistro. However, if someone had the opportunity to eat two meals in the area, I wouldn’t hesitate to recommend Tina’s Café. Just to stick to a few select items.